In 2014 I encountered the visually and aurally distinctive desktop synthesizer, the Atmegatron. 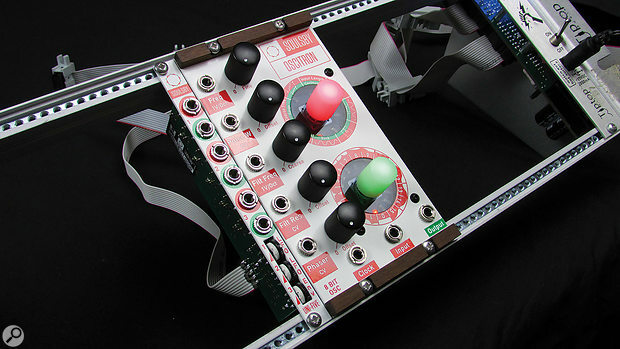 This 8-bit, user-hackable monosynth boasted a spiky digital personality, but thanks to its open-source nature, you (or someone else) could reprogram it extensively. Currently it can switch between being a drum machine, a delay, a four-voice string synth and several other alternatives. 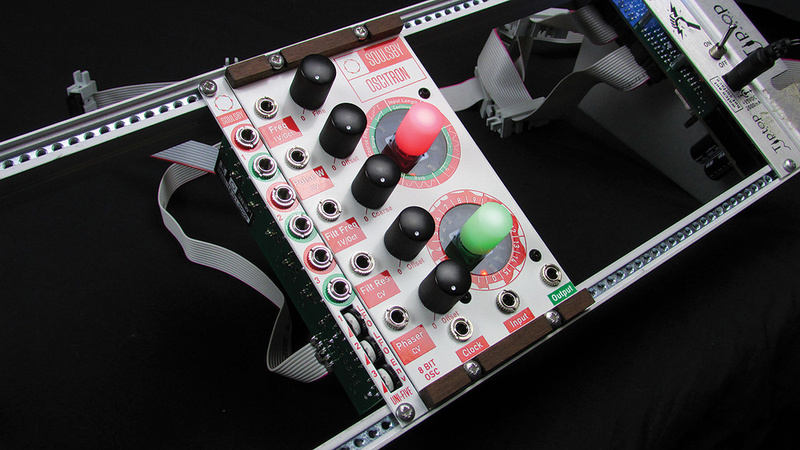 It’s taken a little time but Atmegatron’s powerful audio engine has finally made it across to Eurorackland — along with several juicy enhancements. The Oscitron is more than just an oscillator; it includes a selection of 15 varied filters, a phaser, a pitch-quantiser and a wave crusher. It ships with a companion module, the slim (2hp) but useful Uni-Five. This converts bipolar LFOs and 8V envelopes to the 0-5 V control voltages expected at the Oscitron inputs. Other than to remark that each Uni-Five input has an attenuator, there’s not much more to say except its presence should be a real bonus to anyone who’s ever been frustrated by voltage incompatibilities. Best of all, if you don’t need it you can get the Oscitron even cheaper because both are available separately. Perhaps the main difference between the old and new synths is that the Oscitron features variable audio engine resolution. This affects all stages of the audio chain, the selectable range beginning at half its sibling’s resolution and reaching as high as 4x. You can therefore flip between seriously nasty aliasing, Atmegatron levels of crunch or something with extra detail and, yes, subtlety! Where the Atmegatron was entirely self-sufficient, you’ll need to find LFOs, envelopes and a VCA externally, which is pretty much as you’d expect in a modular environment. Even if you’re new to the Soulsby methodology, you should quickly adapt to the dual ‘push and turn’ colour-switching encoders. The lower ring is used to dial in values, the upper’s to pick a function to edit from two pages (marked in red and green). Both rings are divided into 16 segments and icons offer easy visual representations of parameters, numeric values and filter types. For the simplest introduction, select one of the 16 presets (all of which can be overwritten). First locate the floppy disk icon, then pick a number and confirm. The module’s strengths are many and varied: big, beefy squares, grungy portamento leads, brash patches with built-in fifths or sub-oscillators, plus a selection of delicate digital pings and boings that are ideal to highlight the different audio resolutions. Every patch is based on one of 32 available waveforms and auditioning these without the effects of the filter (its ‘0’ setting) is quite educational: it reveals that even a supposedly pure sine wave is nothing of the sort when rendered by an 8-bit engine. Any and all waveforms may be modified by the pulse-width control, complete with hardware knob and an associated CV input for PWM lovers. Soulsby Oscitron. Size: 14HP. Current: +12V = 130mA. -12V = 70mA.The 1V/Oct pitch input can optionally be quantised to any of 15 scales and while you can fine-tune from a dedicated knob, you’ll need to dig into the menu system to access the coarse frequency and range. Further physical controls and CV inputs cover the expected filter cutoff frequency and resonance. However, the latter may not work in all patches because some filters don’t feature variable resonance. The choices are many and varied, ranging from unusual implementations of low-pass, band-pass and high-pass models to parametric EQs and shelving filters, each armed with different amounts of gain. Together they amount to a potent toolkit for tailoring the sometimes challenging harmonics spilling from the waveform sources. 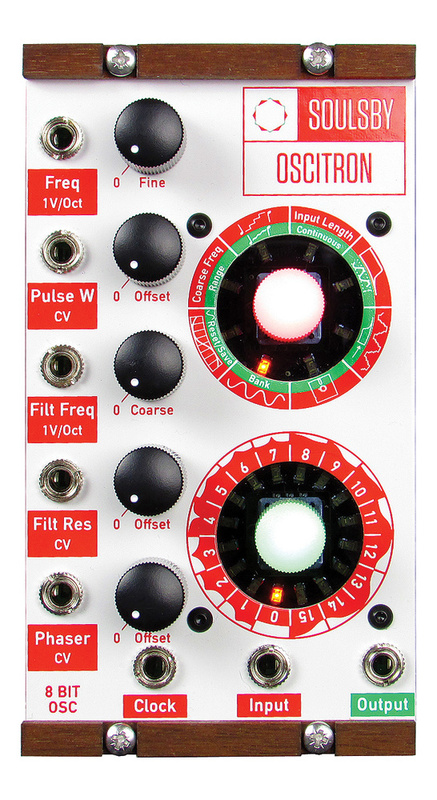 Even the act of sweeping the cutoff and resonance may not be for the faint-hearted, but the resulting crackles and squeals are all part of the Oscitron’s charm and particularly evident if the filter normalise function is turned off. In such cases the waveform hits the filter at full amplitude without much remaining headroom. In contrast, sweeter, less broken-up tones are possible using filter normalisation since the waveform is lowered in level before the filter stage and the resulting output boosted instead. The phaser adds a delayed copy of the waveform overlaid at between zero and 360 degrees. When swept with the knob or an incoming LFO it generates a decent enough old-school phaser effect. Which just leaves the wave-crusher, the last processing stage and one that demonstrates that no matter how gritty the sound already is, it can always get nastier. Another factor that sets the Oscitron apart from the Atmegatron is that any (or all) of its base waveforms can be replaced using a user-sampling process. You specify a desired length — between 4 and 252 samples — ie. short/simple to more complex. If you activate continuous capture, sampling doesn’t end as usual; instead, the waveform is constantly created, resulting in warbly vocoder-like tones. The Clock input can be drafted in to trigger audio sampling but it can be re-purposed via Global settings. It can be used to remotely select the waveform, audio resolution and filter type, as well as change the patch, wave-crusher setting and more. Given there are so many menu parameters ripe for modulation, I often craved more than just a single assignable CV input. I mentioned this to Paul Soulsby, who replied, “I’m awaiting feedback from the first batch of users and then there’ll inevitably be a software update. In theory anything could be routed to anything, it’s just a case of deciding how best to implement it in the interface.” So fingers crossed some of the less-useful CV inputs (for my tastes I’m thinking resonance and phaser) could gain alternate roles in the future. This isn’t a WYSIWYG module and I’m not sure the dual-encoder menu system works as well in the context of Eurorack as it does on the stand-alone Atmegatron module. That said, the patch memories are very useful and the user-sampling is quirky and fun. Ultimately, it’s a great deal of synth in a small space and its personality and range are hugely appealing. And as with the Atmegatron, numerous software alternatives are planned, with a port of the Odytron analogue modelling software scheduled first.